Stretch marks, or Striae distensae (Striae gravidarum when related to pregnancy), are a natural dermatological skin condition that are often the result of rapid and sustained stretching of the skin. Common causes for stretch marks include pregnancy, growth spurts during puberty, excessive weight gain, rapid weight loss, hormonal changes, and even afflict body builders.with scars. Is it safe for use during pregnancy? A mother’s skin blocks many skin care ingredients from entering her body, but small amounts of some ingredients are still absorbed into the bloodstream. Once there, they can cross the placenta and reach the growing fetus. That’s because the “placental barrier” is actually more of a widely spaced filter. It blocks things the size of bacteria, but allows most chemicals to pass easy through. 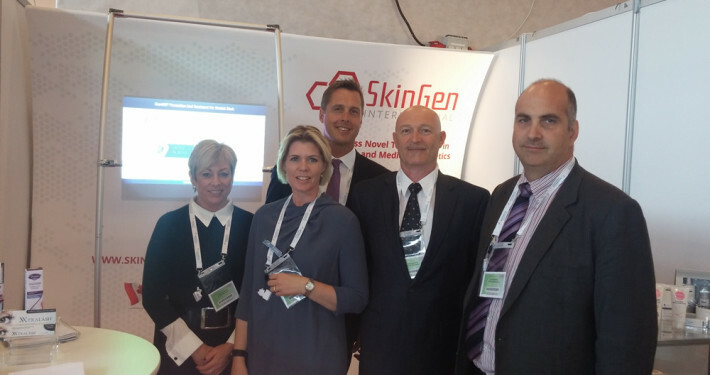 The ScarMD® range has set a higher standard for prenatal safety in the cosmetic industry. 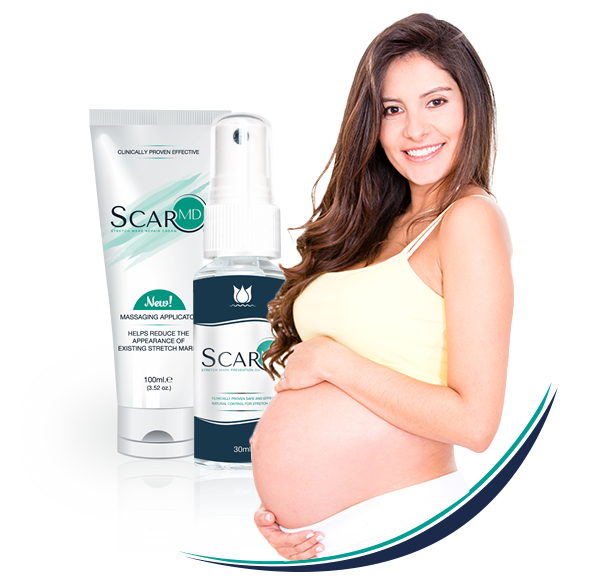 ScarMD®‘s stretch mark products have been screened through teratology databases and are considered safe for use during pregnancy. What are the ingredients of ScarMD Stretch Mark Prevention Oil? What are the ingredients of ScarMD® Stretch MarkRepair Cream? DARUTOSIDE: A botanical ingredient from the plant siegesbeckia orientalis which is found n Ethiopia, Madagascar, Japan, and Australia. Darutoside has been shown to improve the appearance of a Stretch Mark. In controlled trials, Darutoside decreased the visible length of the Stretch Mark by 50%. In the same trial, the indentation depth was decreased by 55%. Are your products allergy tested? Every ScarMD® product is allergy tested. 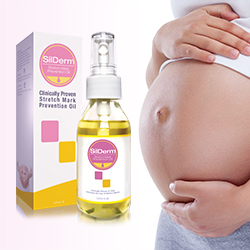 Do you need to use ScarMD® Stretch Mark Prevention Oil throughout pregnancy or can you start application during midterm? We recommend using our Stretch Mark Prevention Oil as early as possible in your pregnancy for the most effective and best results. Remember, it is always more effective to prevent stretch marks..
Do you need to continue after giving birth and for how long? After birth, if you have stretch marks then we would recommend that you use ScarMD® Stretch Mark Repair Cream on the affected area or areas of concern. Is ScarMD® available on prescription? No, the our products are available online, at pharmacies, doctor offices and authorized retailers. What is the recommended length of use for the repair of older stretch marks? Do you need to use it longer than the recommended twice daily for two months? You should continue to use ScarMD® Stretch Mark Repair Cream until no visible improvement is seen. Is the cream fragrance free? ScarMD® Repair Cream has a pleasant citrus smell and the Prevention Oil smells of soothing Lavender. Can it be used on children who have had weight gain / loss? All of the ScarMD® range is suitable for use on children. 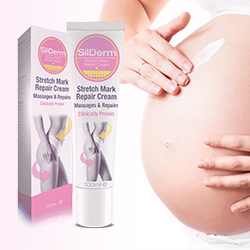 If the child has stretch marks then our Stretch Mark Repair Cream is the ideal way to erase and fade your child’s stretch marks. No, the ScarMD® range doesn’t contain any SPF factors; however, once dry, you may apply sunscreen for added protection. Sunlight typically makes scars worse so we always recommend using SPF30+ sunscreen. If not, can sunscreen be used over ScarMD®? Yes, sunscreen can be applied over the top of both ScarMD® Prevention Oil and Repair Cream. We recommend letting ScarMD® absorb first before doing so for the best results. Is ScarMD® Stretch Mark product line waterproof? No, the ScarMD® Stretch Mark range is not designed to be waterproof so that it can be more easily absorbed into the skin. What is the shelf life once it has been opened? The shelf life of the ScarMD® Stretch Mark Prevention Oil & Repair Cream is 3 years and can be used for 12 months once opened. What is the recommended temperature that the ScarMD® range be stored at? ScarMD® Stretch Mark Prevention Oil & Repair Cream should be stored at room temperature. 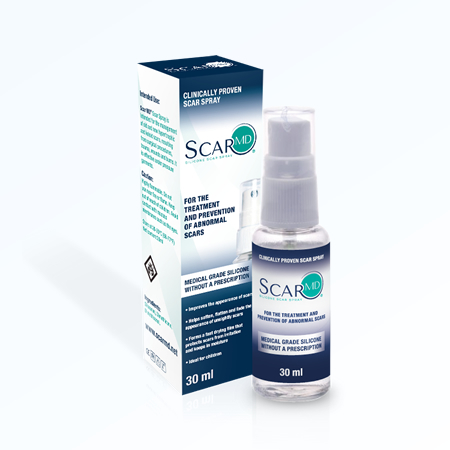 Can the ScarMD® range be used with other topical medications? Our ScarMD® range has contains plant extracts and other essential ingredients and should not interfere with other topical agents. Can it be used on skin disorders i.e. eczema? These products are specifically designed for the prevention and repair of stretch marks. Should you have any other condition please consult your physician. How long does the average tube last for, estimated applications from one bottle or tube? One bottle of ScarMD® Prevention Oil should last you around 1 month; one tube of ScarMD® Repair Cream should last you around 2 months. It depend on the size and severity of your stretch marks and the area affected. Is ScarMD® Silicone Scar Gel effective on all skin types? 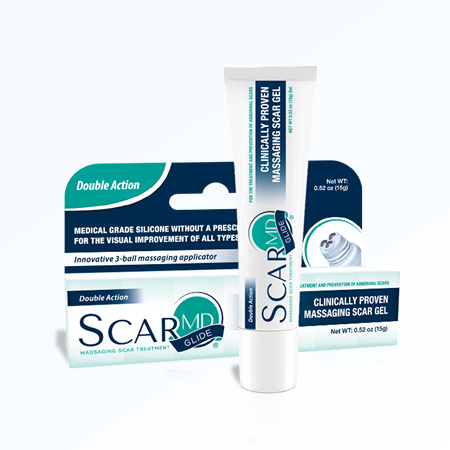 ScarMD® Silicone Scar Gel has undergone rigorous clinical study and is proven to be effective on all skin types and colors. Will ScarMD® Silicone Scar Gel harm my hair? 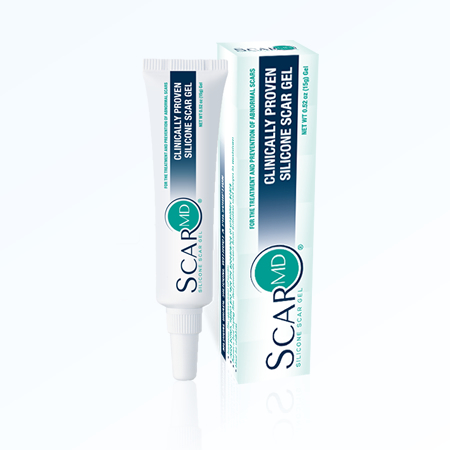 No, ScarMD® Silicone Scar Gel will not harm your hair. There is no effect from ScarMD® Silicone Scar Gel on hair. What is the difference between silicone gel sheets and ScarMD® Silicone Scar Gel ? This ultra-thin waterproof sheet increases the hydration of the stratum corneum but also allows the skin underneath to breath. The thinner the layer, the more durable the material will be and the better the breath-ability. If ScarMD® Silicone Scar Gel is applied too thick then this reaction will take much longer and the gel will remain sticky.